When people envision a pawn shop, and getting a pawn loan they usually only have images from movies or television in their head. Truth is most people have no idea what to expect when they decide to get a pawn loan, and that can sometimes scare them away from what otherwise is a great opportunity to get a much needed loan. Jewelry-N-Loan would like to put your mind at ease. If you’ve been thinking about getting a pawn loan, here’s a few things to expect when you walk into a pawn shop like ours. First, of all, you’ll want to do your research and find a licensed and well respected pawn shop in your area. If you’re in Orange County, Jewelry-N-Loan is your best bet. Second, you’ll want to know as much as you can about the piece you’re looking to pawn before you arrive, so that you have an idea of what it’s worth before you deal. 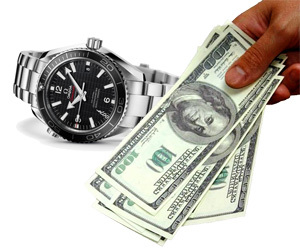 At Jewelry-N-Loan we specialize in loans on luxury watches, diamonds, jewelry and scrap gold…all of which you can Google ahead of time and get a general idea of their value. Lastly, remember that you can always walk away if you feel uncomfortable with the situation or the term of the loan. Only make a deal if you feel satisfied you’re getting treated fairly. At Jewelry-N-Loan we have decades of experience in providing pawn loans to our customers and our reputation for fairness and customer satisfaction is unparalleled anywhere else in Orange County. Once you know what kind of pawn shop to deal with, the process of getting a loan is simple. Just bring your piece into the pawnbroker, or make an appointment to come see them. Once you’re there the pawnbroker will examine your piece and give you a value that they’re willing to loan against it. Ask as many questions as you need to during this process. Any reputable pawnbroker will explain to you exactly how they came about the number they’re offering and show you reasons why it’s a good deal. When you agree upon the price, the pawnbroker will then explain to you the terms of the loan (interest, fees, length, etc), and you will enter into a formal agreement with them. There’s no credit check or background check necessary as your asset is the collateral for the loan. After that…you get the cash you came in looking for! It’s that easy. Jewelry-N-Loan looks to always provide our customers with a comfortable environment to do business in. There’s no pressure and no hidden fees or costs. If you’re thinking about getting a pawn loan on your watches, diamonds or jewelry, call or come into Jewelry-N-Loan on Newport Blvd. In Costa Mesa today!